$16.881 million on -unknown- screens. Maybe I'm just a complete contrarian, but I continue to find myself in the minority opinion about many of the Star Trek films. Oh, I agree with the general consensus for the two best, as Star Trek II: The Wrath of Khan and Star Trek VI: The Undiscovered Country can't be beat. However, my support of the much derided Star Trek V: The Final Frontier and Star Trek: Generations keeps me from total agreement with the mainstream. I'm going to go in an opposite but also potentially unpopular decision about 1986's Star Trek IV: The Voyage Home. This film usually appears in the top rankings of Trek pictures, and it easily seems to be the most popular with casual fans of the series. It received a large audience due to the fact it's much more light-hearted and comical than most of the other pictures. Voyage generally is called the "accessible" Trek. Unfortunately, that easy spirit that lets so many non-fans enjoy the film makes it less and less palatable to me as time passes. Voyage is one of those movies that I initially liked but that ages poorly. With each additional viewing, I find myself less and less enchanted with the picture. Voyage picks up shortly after the ending of Star Trek III: The Search For Spock. Still stuck on Vulcan, the crew of the Enterprise waits to head back to Earth for a trial related to their insubordinate activities. However, a mysterious and extremely powerful probe heads toward Earth and causes mayhem. This cuts short their journey home aboard a “borrowed” Klingon Bird of Prey, as they decide they need to head back in time to save Earth in their present. Why? Because they learn that the probe needs to communicate with humpbacked whales, a species that was killed off two centuries earlier. Admiral Kirk (William Shatner) chooses to head back to the 20th century, retrieve a couple of whales, and return to the 23rd century so the critters can tell the probe to chill. Inevitably, problems arise when they get to 1986. Many of these stem from “fish out of water” issues, while others connect to logistics. Kirk and Mr. Spock (Leonard Nimoy) enlist a suspicious ally when they get to know whale biologist Gillian Taylor (Catherine Hicks). The film follows the crew’s race to save the whales and their own culture. There's just something about the forced humor of the story that wears on me. Trek comedy tends to be broad and unsophisticated in general, and most of its appeal comes from the fact that the Enterprise crew reads it. Like a wisecrack from an octogenarian, it's the incongruous nature of the lines that make them ostensibly funny. That kind of humor doesn't hold up well over time, especially since many of the comedic topics in Voyage seem dated. Unlike the original series itself, this movie appears welded to the middle Eighties and it hasn't made a strong transition into future generations. One other hallmark of its era stems from the rather preachy environmental message of the movie. I'm all for saving the whales and other such do-gooder initiatives, but Voyage really seems heavy-handed in its treatment of the cause. Everything's spelled out so explicitly that it quickly becomes exceedingly tiresome. Trek works best when it's subtle, but the producers of this film have no faith that viewers will get their message unless they beat us over the head with it. In addition, a lot of the movie just doesn’t make much sense within the Trek universe. The crew of the Enterprise act as if they’ve never seen 20th century culture, but they made a few trips back there during the original series; they shouldn’t seem quite so out of place and mystified. Many of the participants behave in ways that seem badly out of character as well, and these elements detract from the overall experience. I might be able to forgive those problems, however, were it not for the movie's most fatal flaw: the presence of Hicks as Gillian. Hicks offers one of the all-time annoying performances in Trek or anywhere else. She emotes her lines horribly and stands as a thoroughly unlikable character. Every time I watch Voyage, I almost start to wonder why I dislike it – until Hicks appears. That’s when the film starts to go into the toilet, and the fact that she’s nearly omnipresent once she hits the screen means the movie can’t escape the negatives she brings. There's nothing in the role that makes it necessarily problematic; it's all due to Hicks, as she appears to be in a permanent snit. Hicks’ turn is so miserable that she almost single-handedly ruins this movie for me; she makes Gillian one of the least-appealing characters I've seen. Star Trek IV is not a bad film, and were it not for Hicks, I’d probably regard it in a more positive way. Still, I really feel the high esteem with which it's regarded is misplaced. It's a fun experience the first time around, but it's an artificial high that decreases significantly with every new screening. I continue to enjoy parts of Voyage but the overall package seems weak. Only the existence of the tedious Star Trek: The Motion Picture keeps Star Trek IV from residing at the bottom of my Trek rankings. 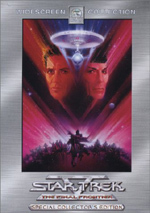 Star Trek IV: The Voyage Home appears in an aspect ratio of approximately 2.35:1 on this Blu-ray Disc. Only minor issues affected this solid presentation. If forced to pick a complaint, it would stem from the use of digital noise reduction. That factor occasionally made skin tones look a little flat and under-defined. However, I didn’t see this as a big concern, and overall sharpness was very good. Some slight softness appeared in a couple of wide shots, but the vast majority of the movie exhibited excellent clarity and definition. No signs of jagged edges or moiré effects appeared, and edge enhancement seemed to be absent. Source flaws also failed to materialize. I noticed one or two specks at most; the film remained clean. Colors looked solid. Overall, the tones came across as nicely accurate and distinct, though a few minor issues arose on board the ships; the use of smoke created slightly messy hues. I didn’t think those visuals were weak, though, and the colors usually appeared very good. Black levels looked nicely deep and tight, and low-light shots exhibited nice clarity. I felt very pleased with the visuals found here; the transfer just barely missed “A”-level consideration. The Dolby Digital TrueHD 7.1 soundtrack of Voyage seemed satisfying. The forward soundstage appeared broad but nicely spatial, with convincing imagery that placed audio in specific spots and blended it together nicely. The mix didn’t boast tremendously active surrounds, but they added to the experience with some effective backing, and we even heard some decent stereo material from the rear on occasion. The scenes with the probe and those that featured action made the best use of the surrounds, so check out the beginning and end of the flick for the most active elements. Sound quality seemed pretty good. Dialogue appeared largely natural and clear, although some slight edginess occasionally occurred. Effects also were realistic and distinct, with some nice punch at times. The audio that accompanied the probe seemed especially rich and strong, as bass response sounded loud and impressive but didn’t become loose or boomy. The score appeared quite bright and vivid, with positive depth as well. Despite the age of the mix, Star Trek IV managed to offer a satisfying audio experience. How did the picture and sound quality of this Blu-ray Disc compare with those of the prior SE DVD release? For the most part, the audio was a wash. The lossless 7.1 mix seemed a wee bit more dynamic and involving, but not to a significant degree. On the other hand, the Blu-ray boasted radically improved visuals. I always thought Voyage was the ugliest of the Trek SE transfers; it seemed soft and messy at times. Those concerns went out the window here. I know the use of noise reduction has caused complaints, and I won’t dismiss those, but I think it’s important that we don’t throw out the baby with the bath water. A Voyage with no noise reduction might look a bit better, but this remains by far the most attractive Voyage ever found on home video. We start with two separate audio commentaries. The first comes from director/actor Leonard Nimoy and actor William Shatner. To my surprise, the pair sat together for this running, screen-specific piece. I expected they’d be recorded separately and have their remarks mixed, but happily, that didn’t happen. As great as this prospect sounded, the reality seemed less than stellar. To be sure, much of the track came across as entertaining and informative. Nimoy dominated the piece, which didn’t surprise me since he did double duty as director and actor, while Shatner just acted. Nimoy related a number of nuts and bolts elements of the production along with elements such as creation of the story, the challenges of acting and directing at the same time, and studio-related problems. Shatner spoke less frequently and tended to discuss more general issues in regard to Trek and his career, though he tossed in a fair number of remarks about Voyage itself. The pair included some nice reflections on their work together and those with whom they’ve served. Unfortunately, the two didn’t seem as connected as I might like much of the time. Some good interaction occurred, but the track didn’t offer a great sense of give and take. The duo also went silent too much of the time, which left the commentary with quite a few empty gaps. Overall, the discussion between Shatner and Nimoy provided an interesting affair, but it didn’t qualify as a great piece. For the second commentary, we hear from *Star Trek (2009) screenwriters Roberto Orci and Alex Kurtzman. Both sit together for this running, screen-specific chat. Since neither had any involvement in Voyage, they discuss the film from the perspective of fans who later came to the franchise. That could be an interesting point of view, which true for the enjoyable chat for Star Trek III from Ronald Moore and Michael Taylor. In this case, however, the result is pretty much a bore. Kurtzman and Orci debate some issues such as the film’s use of humor, but mostly they just tell us how much they like it. Little in the way of insight emerges in this dull track. Another running feature arrives with the Library Computer. This “interactive playback mode” allows you to learn about various elements that crop up throughout the movie. It gives us notes about characters, technical pieces, and other connected tidbits. Some of these are tightly ingrained – such as facts about main characters – while others are more tangential. Because of the changing circumstances of the film’s world, some of the same subjects arise multiple times; for instance, new information about Dr. Taylor comes up as story elements affect her. Under the Production banner, we get five featurettes. Future’s Past: A Look Back runs 27 minutes and 31 seconds and mixes movie clips, behind the scenes footage, and remarks from director/actor Nimoy, writer/producer Harve Bennett, actors Shatner and Catherine Hicks, executive producer Ralph Winter, writer Nicholas Meyer, and associate producer Kirk Thatcher. A fairly general look at the film’s creation, “Past” offers a lot of great material. We learn of topics such as the story’s origins, how the different sections were divided among the writers, concerns related to time travel, “the punk on the bus”, casting Gillian, sets and much more. The shots from the set add some nice glimpses of the production that offer a fun look at those moments. “Past” provides a pretty solid little documentary. For more information at the shoot, we get On Location. This seven-minute and 25-second program offers comments from executive producer Winter, actor/director Nimoy, and associate producer Thatcher along with material from the set. They cover the different spots in San Francisco where shooting took place, and we see more fun footage. I’m not sure why they didn’t just incorporate this information into “Past”, but “Location” seems useful and stimulating nonetheless. More raw footage appears in Dailies Deconstruction. The four-minute and 13-second piece shows a number of different shots and takes for scenes shot on the San Francisco streets. The “double dumbass” bit gets the most attention, but we see some other clips as well. The presentation seems a little awkward, as two different audio tracks run simultaneously, but this still offers a cool extra. Below-the-Line: Sound Design runs 11 minutes and 44 seconds. As one might expect, this featurette covers the creation of Voyage’s audio. We hear from sound effects editor Mark Mangini as he describes his work on the film. An energetic presence, Mangini discusses some of the challenges associated with the Trek universe and he details the specific sounds used in the movie. Mangini proves to be engaging and lively, and he tosses out a lot of fun anecdotes and useful information. For the final “Production” piece, we get the six-minute and nine-second *Pavel Chekov’s Screen Moments. It includes remarks from actor Walter Koenig as he discusses his work in the role, how happy he was to get more exposure in Voyage, and his experiences on the film. Koenig proves to be a fun subject and he gives us some good notes here. Under the category of The Star Trek Universe, we locate seven featurettes. First up, Time Travel: The Art of the Possible runs 11 minutes and 14 seconds and provides information from “three prominent quantum physicists”. We get comments from Dr. Nick Herbert, Dr. Fred Alan Wolfe, and Dr. Jack Sarfatti along with kitschy Fifties-style drawings to illustrate their theories. They toss out some interesting ideas in this moderately useful little piece. For more Earth-bound material, we go to The Language of Whales. This five-minute and 46-second piece includes remarks from marine biologist Ree Brennin. She discusses a little about some different breeds, their social structures and history, and what we know of their language. The program provides some rudimentary information but it seems somewhat basic and flat. To learn something more Trek-specific, we get A Vulcan Primer. In this seven-minute and 49-second piece, we hear from author Margaret Wander Bonanno as she offers a general look at Vulcan culture. She covers material gleaned from the shows and movies as she relates tidbits like Vulcan lifespan, biology and religion. Nothing here will seem new to dedicated fans, but “Primer” provides a nice recap for others. For a glimpse at a less intellectual subject than the Vulcans, we find Kirk’s Women. In this eight-minute and 19-second featurette, we hear from actors Catherine Hicks, Katherine Browne, Louise Sorel, and Celeste Yarnell as they relate their experiences as Trek babes. The best program of the “Universe” bunch, the women tell us their thoughts on the Kirk character as well as Shatner himself. It’s a little puffy at times – Shatner sure gets a lot of ego massage – but the information seems lively and mostly engaging. With that we head to *Star Trek: Three Picture Saga. The 10-minute and 12-second show features Bennett, Winter, Koenig, Meyer, screenwriters Steve Meerson and Peter Krikes, and Trek writers Garfield and Judith Reeves-Stevens. They cover the three-film arc from Khan to Spock to Voyage. Nothing particularly memorable appears here, though I like Koenig’s stories. *Star Trek For a Cause lasts five minutes, 40 seconds as it provides thoughts from Greenpeace’s Karen Sacks and John Frizell. We learn a little about whaling, Greenpeace, and the impact of Voyage. Though this occasionally feels like a promo piece for Greenpeace, it connects well enough to the movie’s subject to avoid becoming a waste of time. Finally, *Starfleet Academy SciSec Brief 004: The Whale Probe fills three minutes, 42 seconds as it delivers a tutorial about the threat found in Voyage. Most of these “Briefs” do little more than reiterate information already found in the movie, and that often holds true for “Probe”. It throws out a couple of interesting ideas but doesn’t add much. Since that finishes the “Universe” area, we now go to the Visual Effects domain and its pair of featurettes. From Outer Space to Ocean lasts 14 minutes, 42 seconds and includes comments from Nimoy, ILM whale creator Walt Conti, visual effects cameraman Selwyn Eddy, whale mold supervisor Sean Casey, computer graphics supervisor Douglas Kay, modelshop supervisor Jeff Mann, and effects cameraman Pat Sweeney. They cover the creation of the whales, the computer graphics for the time travel sequence, the probe and the Bird of Prey. The subjects give us some good nuts and bolts material and illuminate the subjects well. The shortest program to this point, The Bird of Prey runs two minutes, 48 seconds and provides statements from Nimoy as he discusses his design ideas for the craft. We see some blueprints and film clips as well in this short but informative piece. The Original Interviews area includes material shot back in the Eighties, and each of the three featurettes concentrates on a particular actor. The different programs simply show the actor in question as he responds to questions from an off-screen interviewer. Leonard Nimoy runs 15 minutes, 39 seconds, William Shatner goes for 14 minutes, 32 seconds, and DeForest Kelley takes 13 minutes and two seconds. The Kelley interview seems like the best of the bunch, and not simply because he rarely appears in material elsewhere on the Trek DVDs whereas we see a lot of Shatner and Nimoy. Kelley provides some nice reflections on his career and character, and he comes across as thoughtful and likable. Nimoy gives us some decent general comments but doesn’t toss out a lot of useful material, while Shatner generally seems displeased to have to sit through the process. Interestingly, these interviews come “unpolished”, as they run without cuts except for those caused by external factors. I like this rawness, and it makes some potentially fluffy pieces more interesting. In the Tributes domain, we find two sections. Roddenberry Scrapbook runs eight minutes, 17 seconds and consists of an interview with son Eugene Roddenberry mixed with some Trek clips. Mostly the younger Roddenberry just gives us some basic biography, most of which will seem familiar to fans. Toward the end, he contributes a few more personal recollections. While none of these appear to be terribly illuminating, they still come across as more useful than the prior material, and I wish the rest of the program offered more of that information. We hear from additional Trek relatives in Featured Artist: Mark Lenard. This program takes 12 minutes, 44 seconds and uses the same format as the Roddenberry featurette. Here we get remarks from wife Ann plus daughters Roberta and Catherine Lenard. They give us a nice look at the actor’s career and life, and they make this a much more personal piece than the Roddenberry one. As we move to the “Archives”, we get two sections. The Production Gallery offers a three-minute and 54-second compilation of photos. Actually, it starts with video footage of the cast and crew as they pose for one shot, and then it moves to filmed renditions of stills. These seem above average and include some good snaps. Storyboards covers eight different movie scenes. Each segment includes between six and 39 frames for a total of 177 storyboards. Mostly we see drawings of the probe, starships, and whales, and these boards don’t seem very interesting to me. Finally, the Blu-ray offers the film’s theatrical trailer along with some Previews. 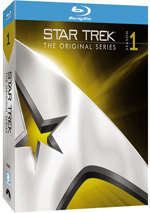 The disc opens with ads for the 2009 Star Trek feature film and for Star Trek: The Original Series Season One Blu-ray. As a film, Star Trek IV: The Voyage Home offers intermittent pleasures but suffers from a number of problems. Most of those can be traced to the performance of its lead guest actress, but it also falters due to an overly comedic tone and much out of character behavior. Still, even erratic Trek remains enjoyable. This Blu-ray edition of Voyage provides very good picture and audio as well as a nice complement of supplements. At no point does this release touch perfection, but I feel satisfied with it; the Blu-ray easily provides the best home video incarnation of Voyage to date.